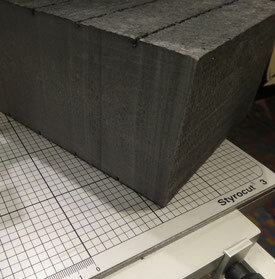 HD300 is of higher density and strongneess than other styro- foam you know from architecture. Its wire-cutted section is more smooth than others. The blue colour is often inconvenient but provides small and thin parts from the light shining through it. Many colours may fit for colouring HD300. They should be useful for styropore (most colours for home use will fit). To avoid the blue colour shining through the white we advice to colour light grey first and white colour in second application.